Cordell passed on April 18th at the age of 60 due to complications from an unspecified illness. United Soul’s “I Miss My Baby” – a song led by Garry Shider with Cordell Boogie Mosson. Their first official single together for the Parliament-Funkadelic empire. We love and will never forget our brother Cordell Boogie Mosson. He passed away April 18th, 2013. Memorial details will be announced soon. Here is a brief biography we have about Boogie, but it doesn’t express what a joyful friend and family member Boogie is, or any personal stories. Please let us know of your memories in the comments below. Cordell “Boogie” Mosson (official name: Cardell Mosson) was born October 16, 1952. A good friend of Garry Shider, the two left Plainfield, New Jersey in their teens to go to Canada. They joined a band called United Soul, which came to the attention of George Clinton, who had known Shider as a youth in Plainfield. In 1971 Clinton produced several tracks by United Soul with input from members of Funkadelic. The songs “I Miss My Baby” and “Baby I Owe You Something Good” were released as a one-off single by Westbound Records in 1971 under the group name U.S. Music with Funkadelic. All the tracks recorded with Clinton in 1971 were released by Westbound in 2009 as the album U.S. Music With Funkadelic. After producing United Soul, Clinton then invited Mosson and Shider to join Parliament-Funkadelic. Two United Soul songs were rerecorded on later Funkadelic albums with Mosson as a member. 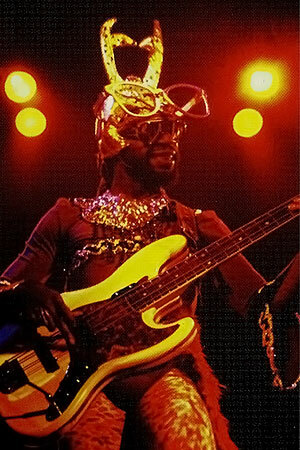 Mosson was a prominent contributor to albums by both Funkadelic and Parliament from 1972 until the dissolution of the two groups in the early 1980s, and was the featured on-stage bassist for Parliament-Funkadelic after Bootsy Collins went solo. While Collins is more widely remembered as the P-Funk bassist, Mosson’s contributions were arguably as numerous and are well regarded by fans. Mosson also appeared in the movie PCU as himself, in 1994. His name as spelled on his birth certificate is Cardell Mosson, and “Cordell” is a common misspelling in the notes for most of the Parliament-Funkadelic albums on which he appeared. Mosson is a member of the Rock and Roll Hall of Fame, inducted in 1997 with fifteen other members of Parliament-Funkadelic. ← Bernie Worrell Fundraises For Tour Van!!!! 11 Days Left (Exp. March 18)! !